This is something I made to go along with the chicken fried rice. I've always wanted to make my own egg rolls - since they are so much healthier than the fried version you get from a Chinese restaurant. I was really surprised at how similar the inside filling was to the actual filling inside a typical restaurant egg roll. I omitted the shrimp from the original recipe, since I'm not a huge fan of shrimp - but I actually think this would have tasted even better with the shrimp. I'll definitely try these again to experiment some more. I used olive oil cooking spray to coat these before baking - and they really crisped up nicely. Definitely a fun recipe to try out. 1. Combine the chicken breast in the bowl of a food processor. Mince with brief pulses until chicken is finely chopped. Transfer to a bowl; set aside. 2. Replace the blade of the food processor with the shredding attachment. Shred the cabbage to yield 2 cups. Shred the carrot. Transfer the cabbage and carrot to a bowl; set aside. 3. Heat 2 teaspoons oil over medium-high heat. Cook garlic and ginger just until fragrant, about 30 seconds. Add the shredded cabbage and carrot to the pan and sauté just until the carrot is slightly tender, about 3 minutes. 3. Add the chicken to the pan. Mix in the oyster sauce, fish sauce and bean sprouts. Stir until well combined. Remove from the heat and stir in the chopped cilantro. 4. 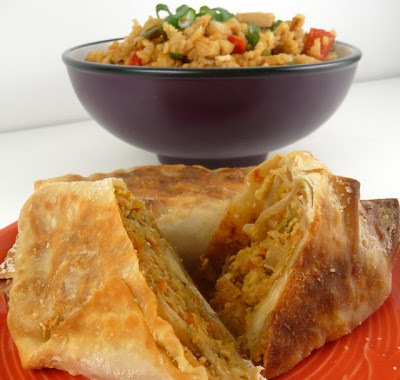 Preheat the oven to 400 degrees F. On a work surface, orient an egg roll wrapper with a point toward you. Place about 2 tablespoons of filling near the edge of the wrapper. Flip the point up over the filling, rolling away from you to cover the filling. Fold both sides in and continue to roll. Use a dab of egg white on the loose point of the wrapper to help seal the roll completely. Transfer to a baking sheet lined with parchment paper. Repeat with the remaining wrappers and filling. 5. Spray the rolls lightly with cooking spray. Bake until golden brown and slightly bubbly, about 15-20 minutes. I really love this delicious rolls. Thanks for sharing. Can these be made in advance and then frozen? Timothy - I think that would work - enjoy!